A smiling, cowboy-hat-wearing James Reents is greeting oil pipeline protesters in Minnesota's lake country this summer in a big way — his picture is plastered on two billboards with the message, "Welcome Water Protectors." Reents, who doesn't normally seek out that kind of attention, is also planning to travel to St. Paul from his home on Ten Mile Lake near Hackensack, Minn., to speak at a state Public Utilities Commission hearing over a pipeline next week. He has been writing and re-writing the 10-minute statement he'll make, opposing Enbridge Energy's plan to build a new line to replace its aging Line 3 oil pipeline that runs through northern Minnesota. "We're all water protectors," he said. Reents and his wife began that work by trying to keep invasive species out of their own lake. Now, in retirement, pipelines have their attention. "What we realized is that the issues of water and water quality are much larger," he said Thursday. 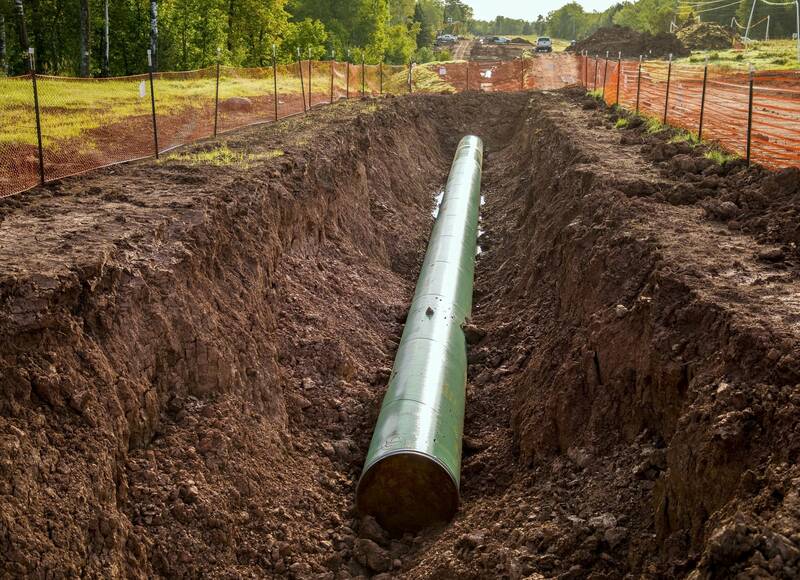 Beginning Monday, the PUC will hear final arguments for and against the new pipeline. The commission is expected to decide whether — and how — to allow the project to move forward no later than June 28. The testimony and the decision comes after a nearly four-year process, but they will mark the beginning of what could continue to be a long, emotional battle for those invested in the project's outcome. Protesters from across the country are expected in Minnesota this month, and they might stay. "When the state rejects Enbridge's proposal, we will celebrate," Winona LaDuke, the longtime environmentalist and indigenous rights activist, said Thursday. Her group, Honor the Earth, put up the billboards with Reents' face on them. If the PUC approves Enbridge's project? "We will be ready to camp and protect our water," she said. 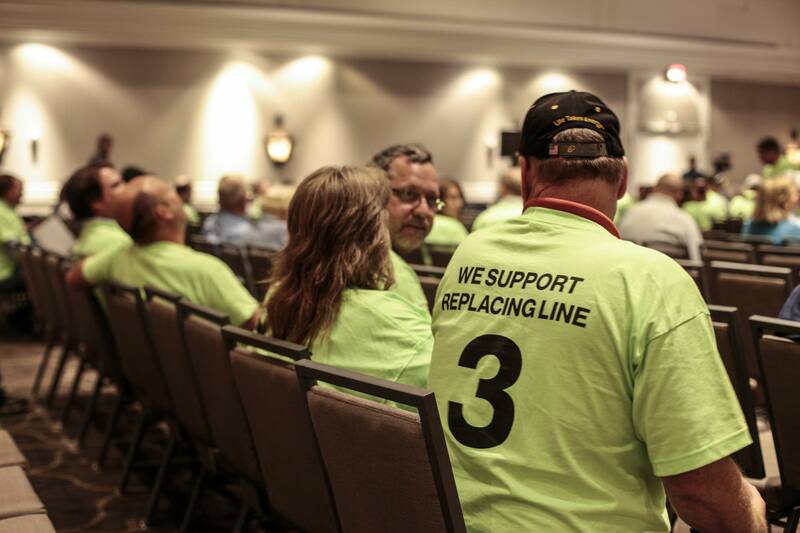 "This is like the red zone in an NFL game," Enbridge CEO Al Monaco told a group of dozens of people gathered in Duluth earlier this month, in an event sponsored by the Minnesotans for Line 3 activist group. "We're at the 20-yard line, maybe a little further, but as everybody knows, it's hard sledding that last 10, 15, 20 yards." While pipeline supporters and opponents plan to pack hearing rooms in downtown St. Paul this week and next, at this point they can do little more than pull on colorful T-shirts, listen and wait. Many of them are planning to stand in line for hours early Monday to get a free ticket into the main PUC hearing room or one of the overflow rooms being set aside for the occasion. "Sounds a lot like getting the new iPhone at the Apple store, right?" said Andy Pearson, Midwest tar sands coordinator for MN350, a climate action group opposed to the pipeline that has been closely watching the case. In terms of entertainment value, though, Monday's and Tuesday's closing arguments likely will come with few surprises: Thousands of pages of evidence, testimony and public comments have been filed in the case over the past three and a half years, so the hearings will be Enbridge's last chance to answer questions and put forth its best case for a Certificate of Need. The five commissioners — each appointed by Gov. 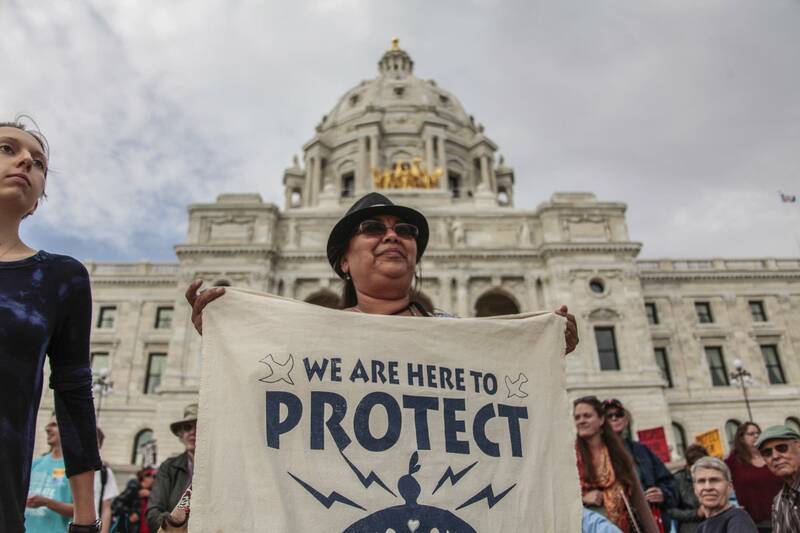 Mark Dayton over the past five years — will deliberate and vote after they've heard from tribes, young climate activists, oil shippers and others who filed legal arguments and were granted official inclusion in the process through speaking roles and chances to challenge Enbridge experts. Enbridge's 1960s-era Line 3 enters Minnesota in Kittson County, making its way to Clearbrook, Minn., then north of Leech Lake, past Grand Rapids and on to Superior, Wis.
"It's old and tired," said Bob Schoneberger, CEO of Duluth-based United Piping, Inc.. He has worked on the line during his 37 years in the pipeline maintenance business. A strong, tape-like coating on the outside of the steel pipe is designed to protect the pipeline from the elements, he said, but it has its limits. "If the coating starts failing, it starts rusting. And when it rusts, you lose metal," Schoneberger said. To keep operating the old line safely, Enbridge has said it would have to perform 6,200 digging projects to maintain the pipeline over the next 15 years — an expensive and disruptive proposition, especially because the flow of oil would need to slow or even stop in some cases. The pipeline is already operating at reduced capacity for safety reasons. 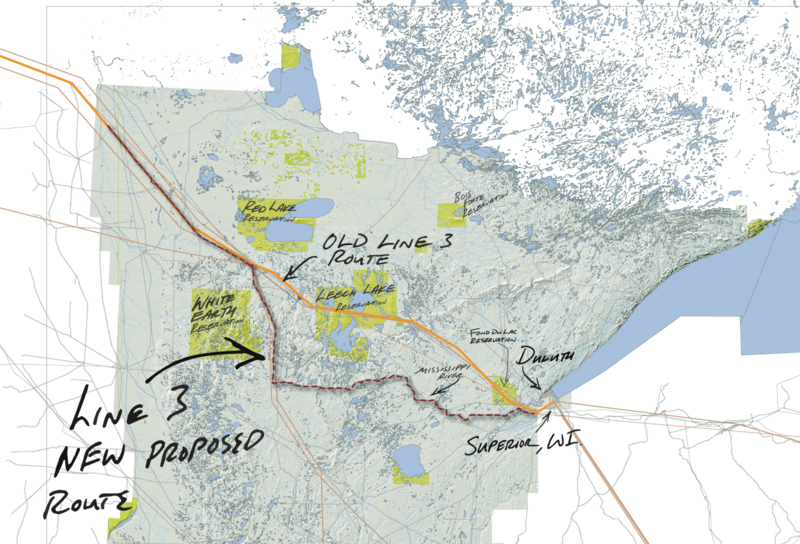 Instead, Enbridge proposes to build a new, 337-mile Line 3. Part of it would travel the same route as the current line, but most of it would cut through a different part of Minnesota. At Clearbrook, the pipeline would head south past Park Rapids and then travel east through a sparsely populated area of central Minnesota before skirting Duluth to the south and hooking up with Enbridge's terminal in Superior. Enbridge officials have said they want to begin construction this fall. The company's preferred route avoids the Leech Lake and Fond du Lac reservations, whereas the current Line 3 crosses both. "We designed the route specifically to avoid tribal areas," Monaco told the supporters. While avoiding reservations, the new route would cross treaty areas — large swaths of northern Minnesota where tribal members have the right to hunt, fish and harvest wild rice on lands they gave up long ago in agreements with the federal government. "The ecological, social and spiritual damage to the Anishinaabe people is unacceptable," LaDuke said. LaDuke said newly purchased land near Park Rapids will serve as a protest camp for Minnesota activists and those traveling from out of state. She said Honor the Earth is also encouraging people to camp on public land along any part of the proposed route. "People have asked me if this is going to be like Standing Rock. Standing Rock, by the time they got to the end, all they had left was that piece," LaDuke said. "We've got 300 miles of Minnesota upon which people can defend their water." That could make responding to the protests a challenge for law enforcement agencies, including counties with small staffs, although the size and nature of the protests will depend on which way the PUC rules. The commission could grant a Certificate of Need with or without conditions. It could also deny Enbridge's request, or come up with an excuse not to rule one way or the other. Right now, it isn't clear what will happen — PUC commissioners do not indicate publicly which way they are leaning on issues ahead of the formal deliberation process. Scott Strand, an attorney with the Environmental Law and Policy Center who is representing Line 3 opponents Friends of the Headwaters, said he expects the PUC will make some kind of decision. "I think they want to do something and be done with it," said Strand, who has extensive experience with the PUC process. He said scheduling four days for arguments and deliberations "is a little unusual." "They don't want anybody to be able to argue that they were somehow left unheard," he said. "I think that they recognize that this is important." A sweeter deal for Minnesota? In recent weeks, Enbridge has made new commitments to sweeten the deal for Minnesota, including possible concessions on local property taxes, a $100 million investment in Native American businesses and employees, and an offer to remove the old Line 3 pipeline for landowners who request it, if the new one is built. "While we do believe our current deactivation plan that represents long-standing industry best practice and, we believe, is overall less risky and better for the environment, we are committed to working with the landowners," said Jennifer Smith, Enbridge's community engagement manager. Smith said most landowners along the new route — 94 percent — have signed financial agreements with the company allowing the pipeline to cross their land. But Enbridge officials are concerned about how the judge advising the Public Utilities Commission views the project. Administrative Law Judge Ann O'Reilly was assigned the task of hearing all evidence and testimony and writing a report, which included her recommendation to give Enbridge a Certificate of Need — but only if the new pipeline is built in the same trench as the old Line 3. That plan would dramatically reduce the amount of oil flowing through the state for months during construction, a situation Enbridge wants to avoid by building the new pipeline first. The state Department of Commerce, meanwhile, has argued the pipeline isn't needed at all, citing evidence that U.S. demand for oil is flattening. "Who could possibly be opposed to replacing a pipeline, 50 to 60 years old and operating at 50 percent capacity?" Republican U.S. Rep. Jason Lewis asked the pipeline supporters at the Duluth gathering, noting that the Pine Bend oil refinery in his district depends on Canadian crude via pipeline. "It makes no sense not to move forward on this as quickly as possible." This spring, Minnesota House Speaker Kurt Daudt made an impassioned speech on the House floor — his first since becoming speaker four years ago — and said the pipeline project would be the equivalent of building two Minnesota Vikings stadiums. "This is a $3 billion private investment," he said, noting the several thousand construction jobs the pipeline would create. "We don't have to choose between jobs and the environment. We can actually do both." For opponents, Daudt said, working to stop the pipeline might feel good, "but you're not stopping any oil from coming out of the ground." Enbridge has made that argument, too, saying oil will continue to flow without the new pipeline. While estimating the environmental impact of the project is complicated, opponents argue the risks and costs of building the pipeline are far greater than not building it. According to the project's environmental impact statement, the estimated price tag to society from all the oil to be extracted, processed and burned over the life of a new Line 3 could reach into the hundreds of billions of dollars. "As young people, we will be living with the consequences of Line 3 much longer than Enbridge and the decision-makers," said Margaret Breen, one of the 13 Youth Climate Intervenors leading opposition to the project, during an anti-pipeline rally on the steps of the Minnesota state Capitol last month. The high school and college students will be among the groups presenting at the state Public Utilities Commission hearings next week. Breen quoted part of the petition the young people wrote that earned them a seat at the table for Monday's final arguments: "Our generation faces a daunting future, and so we are compelled to fight for our right to the privileges and stability that generations before us took for granted."